But it’s impossible to achieve the promises of Lync if you haven’t fully considered the underlying infrastructure. And with laptops, smartphones and tablets on track to outnumber desktops, that means wireless infrastructure. Fortunately, with a little upfront planning, you can dramatically increase the quality and reliability of multimedia over enterprise Wi-Fi. 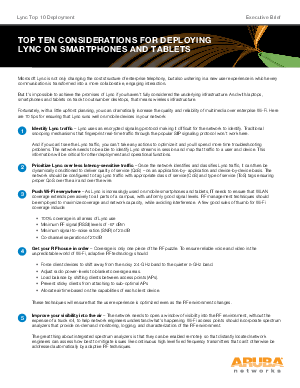 Be sure to learn the 10 tips for ensuring that Lync runs well on mobile devices in your network.